Steiff Teddy bear Panda Ted Discounts Apply ! Made from a Black and White dense fluffy Alpaca, very soft. Of all our 2010 Limited Editions, he’s the biggest, most lovable of them all!, Meet our 60 cm Panda, part of the exciting “bear Ted” series that began in 2007. Like his brothers the Grizzly Ted, Polar Ted, and Moon Ted. 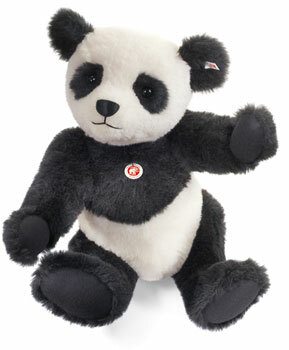 Panda Teddy Bear is part of Steiff's 2010 Exclusive range. He comes in a presentation box with certificate.